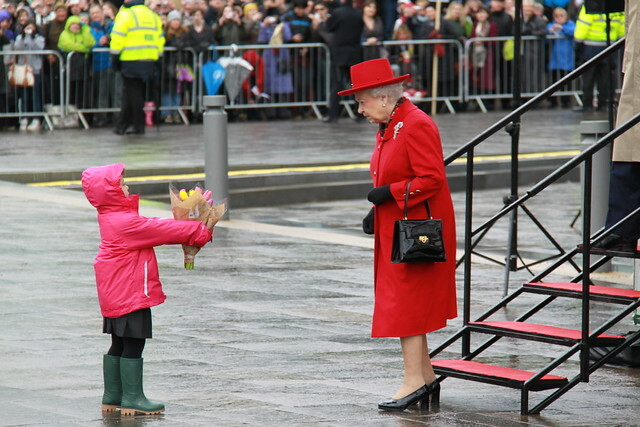 HUNDREDS of people turned out this morning to witness the Queen's visit to Greenwich. Despite the down-pouring of rain which has become a characteristic of this drought, a large crowd gathered in Cutty Sark Gardens over an hour before the monarch's arrival. Trumpets sounded to announce the imminent arrival and as if by royal arrangement, the rain seemed to stop. Those reluctant to take down their umbrellas were quickly urged to do so by crowd members keen to catch sight of the Queen who had minutes earlier officially named the royal barge Gloriana at Greenland Pier. 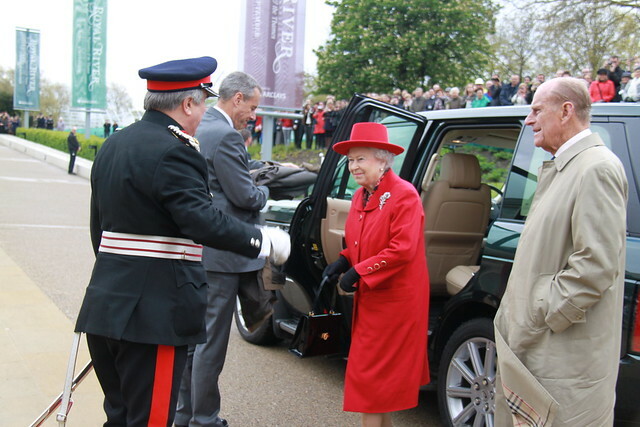 At 11.26, a Range Rover pulled up, bearing the Royal Standard, from which HM The Queen and HRH The Duke of Edinburgh emerged to be greeted by the mayor of Greenwich, Jim Gillman, the Leader of the Council, Chris Roberts, and the Council's Chief Executive, Mary Ney. 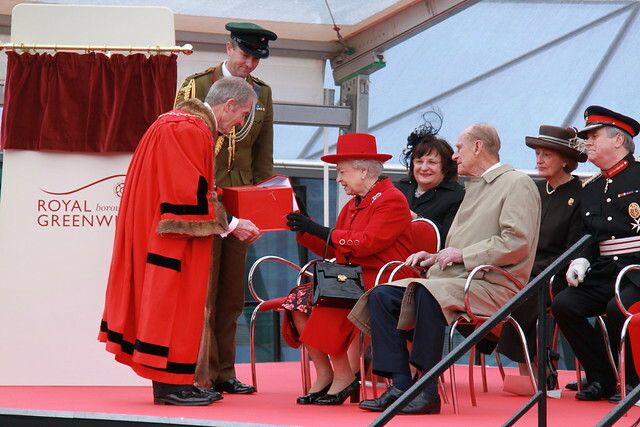 They were seated on a stage near the bow of the Cutty Sark where Councillor Roberts gave a short speech and Her Majesty was presented with a gift by the mayor. Prince Philip was given a framed certificate confirming the Freedom of the Royal Borough that he was awarded in March. The Queen then unveiled a plaque to mark the opening of the newly re-landscaped Cutty Sark Gardens. After listening to a suite of music, composed for the Queen's Jubilee and performed by children from across the borough, the royal guests received a bouquet (pictured top) and made their way in to the Cutty Sark as the crowd cheered. "Hello Queenie" was shouted from somewhere deep in the crowd. The royal couple were then shown around the restored Cutty Sark. Prince Philip is the President of the Cutty Sark Trust and was instrumental in bringing the iconic tea clipper to Greenwich in the 1950s. The Queen unveiled a plaque to officially declare the Cutty Sark open, just as she first did in 1957. The Queen was then taken through the Old Royal Naval College, where she knighted Sir Francis Chichester in 1967, for an inspection of the King's Troop which moved from St John's Wood to Woolwich in February. 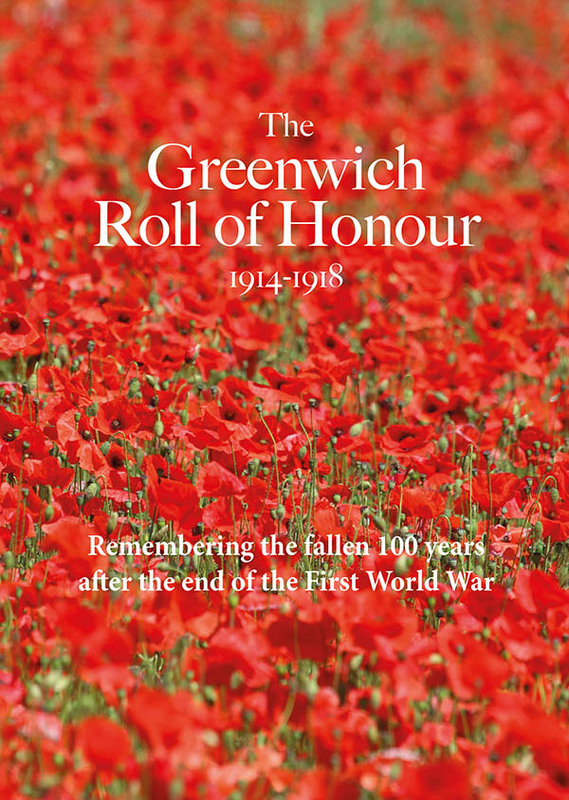 While the Queen was en route to the National Maritime Museum, a number of savvy onlookers lined the northern tip of the Greenwich Park, opposite the museum for a sighting that hadn't been publicised before. The crowd was entertained by music from the Royal Hospital School marching band as they waited for Her Majesty to arrive. 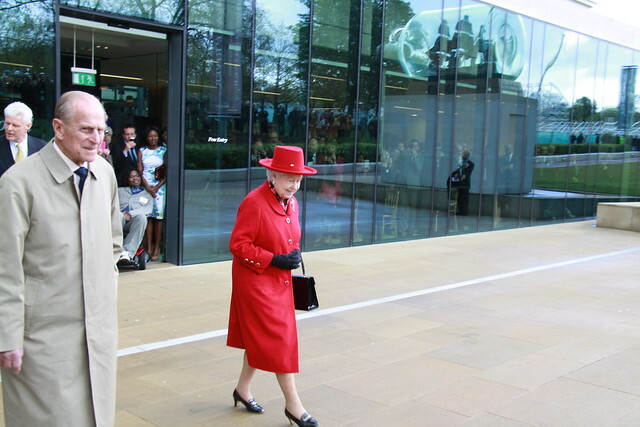 Once inside the museum, almost seventy-five years to the day since she attended its opening ceremony, the Queen was shown around the new Royal River exhibition by guest curator, David Starkey. After about twenty-five minutes, the couple emerged, smiling, to find sunlight had started to break out. Passing the newly-installed Ship in a Bottle, they returned to their car and left as the line of onlookers cheered, clapped and waved flags. Hats off to Greenwich Mayor Jim Gillman who braved the rain to speak to people in the crowd before the royal arrival. Good point, Paul. It was good to see you there too! Well done Mayor Jim Gillman, despite the rain I am sure he managed to say ‘hello’ to everyone in the crowd and even had time to pose for my snap of him. A memorable day! That was a very sweet moment 🙂 You probably got pictures but let me know if you want full size versions of the couple I took for your own use. Unfortunately my wife and I couldn’t make. The first we knew of it was on the lunch time news. “Despite the down-pouring of rain which has become a characteristic of this drought”. Brilliant comment, made me chuckle at the end of a very long day.